I almost always cut 2 1/2"xWOF strips of fabric to make my binding. *WOF= Width of Fold, which is generally 42 usable inches. 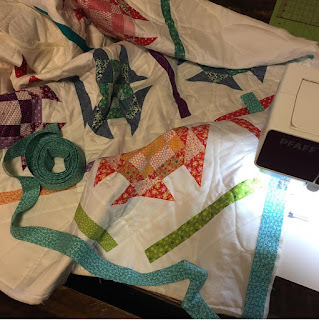 To figure out how many strips to cut, add up all four sides of your quilt and divide that number by 42. 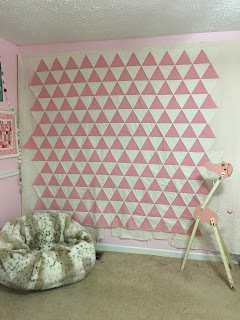 For example, my quilt was 82"x90". 82+82+90+90=344. 344 divided by 42= 8.2. Always round up, so in this case, I cut 9 strips of 2 1/2"x42". Join them all together, then roll it up to make it tidier for stitching. and here for how to attach it. Once you've got your binding mostly stitched on, you are ready to join the ends. Make sure to give yourself plenty of space between the loose ends to work! 20" is ideal, but make the most of what you can with the size of your quilt. Now is a good time to trim the other binding end to a 45* angle if you haven't already done so. Align the 45* line with the bottom edge of your opened up binding; use the fabric marker to draw the line. Notice that this is the tail on the left. 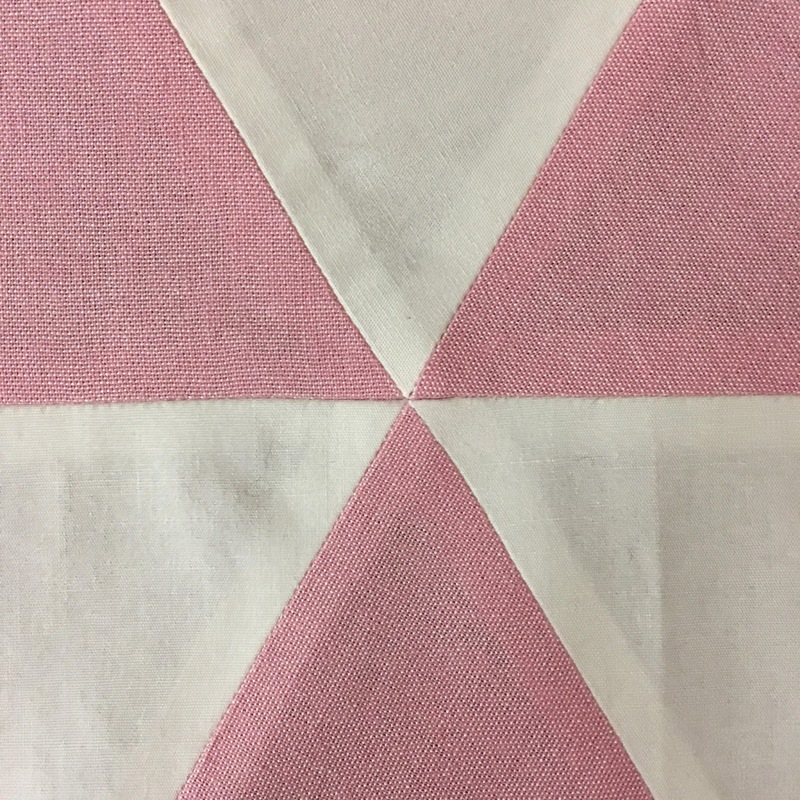 Open up the binding tail on the right, aligning the bottom raw edge with the edge of the quilt. 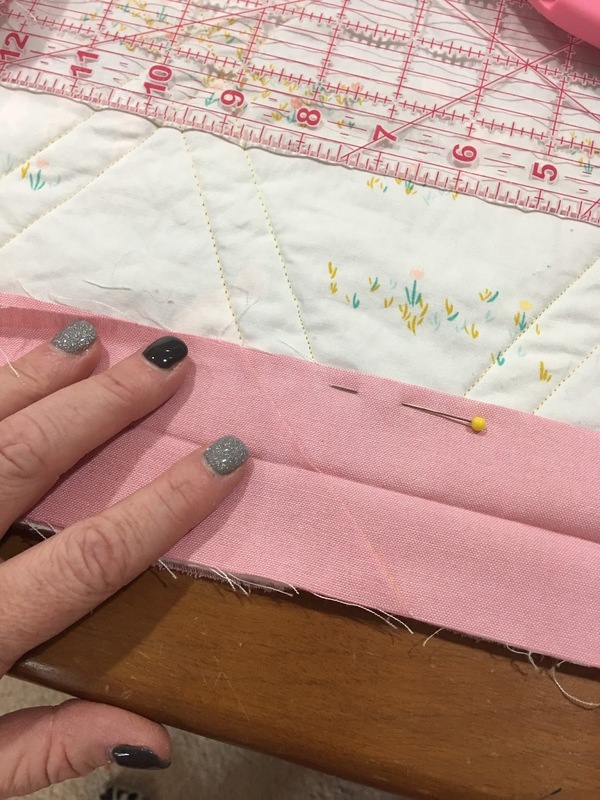 Make sure there are no gaps or wrinkles in the binding and that it is perfectly smooth and matched up with the quilt! Pin it in place so it doesn't shift while you're working on the rest. Place the tail on the left on top of the pinned tail on the right. 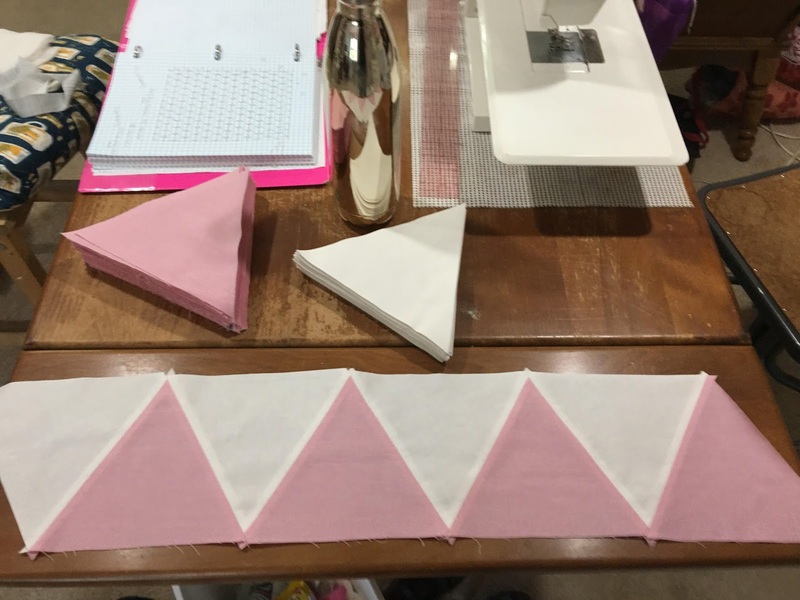 Use the ruler as a guide to draw the cut angle of the tail onto the binding below it. Remove the top tail, measure 1/2" to the LEFT of the original line; cut on this new line. This accommodates the 1/4" seam allowance for both sides. Place the tails right sides together; pin in place and stitch. 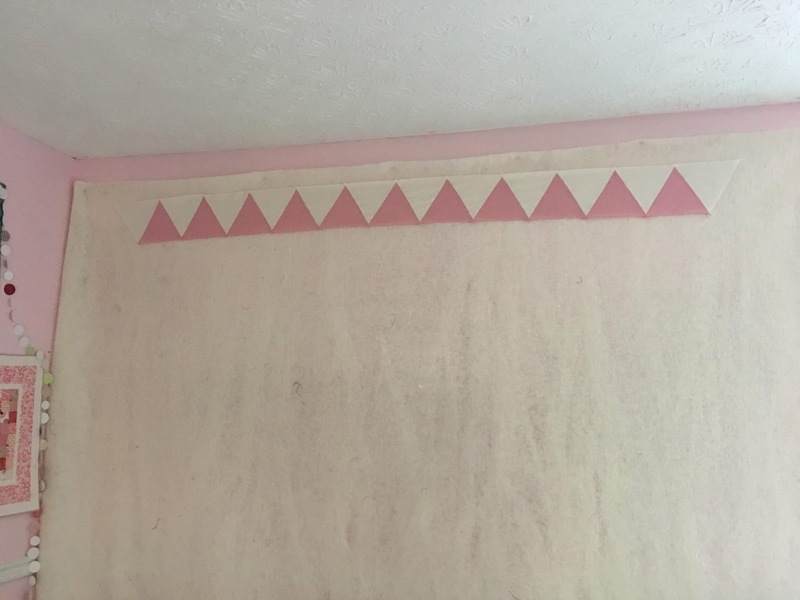 Because the ends are at an angle, you will have little triangles sticking out of both sides by 1/4". This part always confused me, so I took a picture at a distance and close up so you can see how this is supposed to look. Now all you have to do is finger press that seam open, refold the binding on its original crease and finish stitching it to the quilt. Well done, you! I'll do my best to remember to take photos of the making and attaching steps the next time I'm working on a quilt. I hope you've found this tutorial to be simple and straight-forward. PS For details on the above quilt, click here. Hey! Wow, does this thing still even work?? I guess we'll find out, right? 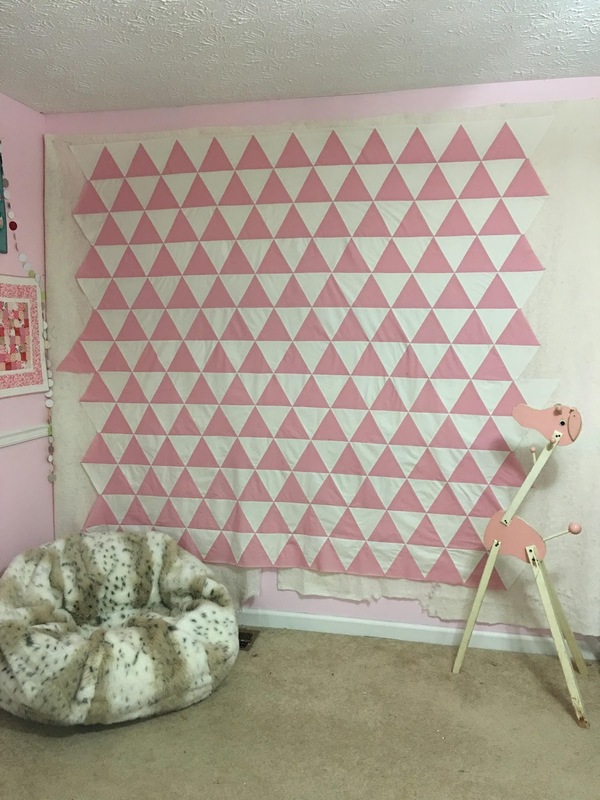 I would like to show you my most recent finish: a triangle and hexagon quilt featuring the Reverie Fusion fabric collection by Art Gallery Fabrics. My friend Mathew, aka "Mister Domestic" is the zany, crazy, awesome personality behind their brand and he's come up with a brilliant way to showcase their various collections by hosting Mister Domestic's Sewing Party. He asked if I would like to participate in the upcoming round, and of course I said yes. I sat down with my graph paper and newly purchased (and now lost) mechanical pencil and sketched out a design. 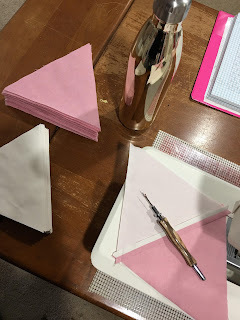 A little quilt math, some coloring between the lines, a quick peek at the collections online, and I was on my way. and a day and a half for the hexagons themselves. that's just the way it goes! Before long, I was doing two rows per hour. 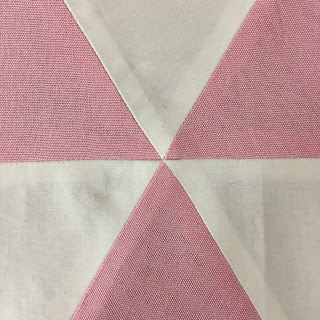 Somehow there were a few extra triangles, but it didn't matter because I still had to trim the quilt. Then again, I also had a few not so perfect points in there as well! 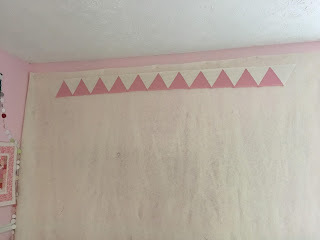 I figured that since my top was already perfectly in place on my quilt batting design wall, I would just use that for the quilt and replace the one for the wall. It was about that time anyway, the bunnies had nibbled the bottom of it and it was looking kinda ratty. This was actually a really good decision because it made making the quilt sandwich a lot less tedious. I only had to spray baste the backing to the batting/top-and no pin basting! Yay! Thank you to English Paper Pieces for the handy little 1 1/4" papers and the acrylic template! Luckily, I had the perfect shade Aurifil 50wt thread in yellow (#2130) to do the quilting. It was the perfect bright golden shade for this collection of fabrics. Taffy (the puppy I mentioned earlier) kept me company while I worked. She's such a sweet little doggy! I am really happy with the way this quilt turned out. It still amazes me when I can pull something out of my head and make it turn out exactly as I imagined. Come back tomorrow for a quick little tutorial on how I join the ends of my quilt binding!